“Stretching first thing in the morning helps your circulatory system actually deliver nutrients to muscle tissue, which in turn helps your body perform your daily activities with more ease. For example, by the time you show up to your after-work exercise class, you won’t have to worry about pulling any muscles or straining yourself — all thanks to an a.m. stretch routine. 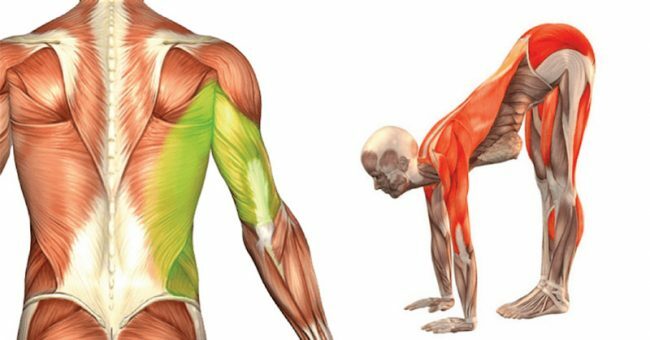 Plus, if you’re part of the 80 percent of Americans who report feeling stress on the job, some morning stretches can definitely help to relieve or lessen those feelings, as well as target the emotional tension that might be taking up residence physically in your back, neck, or legs as a result. Stretching offers huge benefits for our health, as it increases our flexibility and range of motion, improves body posture, relieves back pain and reduces the tension in the muscles, relaxes and calms the body, and strengthens the entire body. Stand with the feet spread hip- distance apart and the knees slightly bent. Hinge forward at the hips, for the upper body to hang over the legs, and grasp the elbows. Hold for 4 breaths, and then slowly come up by pulling in the abs and round the vertebrae up one at a time. Repeat twice. With the left heel placed on a chair lower than the hip, flex your foot, and bend forward toward it for a deeper stretch. Hold for half a minute. Take the left leg with the knee bent on the bed. Square the hips while the front knee is placed outside of the front shoulder. Bend forward at the hips, with the spine straight, and place the hands on the bed. Hold for 5 deep breaths. Repeat on the other side. Place the arms on the door jam, step the foot through the threshold, with the upper arms parallel to the ground, and the forearms aligned up and along the doorway. Next, bend the front knee to feel the stretch in the shoulders hold for half a minute, and repeat with the other leg. Clasp the hands, stretch the pointer fingers, and hold them over the head. As you reach forward, breathe in, and breathe out as you bend the body to the right. Breathe in slowly 5 times, return to the center, and repeat on the left side. Start with the knees and hands on the ground, the palms placed directly under the shoulders and the knees right under the hips. Inhale, pull the abs, and arch the back up like a cat stretching. Then, return to the initial position, bend the upper part of the spine upwards while supporting it with t the help of the abs. Keep the neck as a long extension of the rest of the spine, and don’t let the head fall back. Repeat to the starting position, and make 5 repetitions. Stand up, facing a wall, the arms straight in front of you, and the hands flat against the wall. Keep the right leg forward with the foot flat on the ground, and stretch the left leg behind you with the heel flat on the floor. Then, lean into the wall, and hold for 30 seconds. Switch to the other side, and repeat twice with each leg. Clasp the hands behind the back, elevate the arms behind while bending forward at the waist. Hang the head loose and raise the arms up overhead. Try to touch the palms together. Hold for half a minute, and make 3 repetitions.